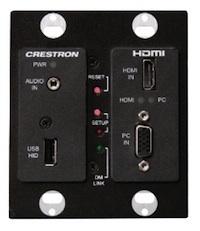 Crestron has rolled out a new AV wall plate that switches between two inputs and transmits audio and video output through a single cable. Dubbed the DM-TX-200-2G, the wall plate features an HDMI in port, RGB PC in port, analog audio in port, and a USB 1.1 input port for keyboard and mouse control. The wall plate switches between the HDMI and RGB inputs while using green LED indicators to denote which one is selected. Rear connectors include a CAT output and DMNet port. The DM-TX-200-2G is designed tobe mounted in a double-gang electrical box with a minimum depth of 2.5 inches. Other features include EDID format management, used to prevent lost audio and video quality from conflicts with display and input devices, and CEC embedded device control, a technology that uses a signal embedded in the HDMI standard to control CEC-enabled devices. Other features include a setup button that activates Ethernet auto-discovery and LED indicators for power, DM link, and Ethernet. The DM-TX-200-2G is currently shipping. Further information is available here.